“Kellogg’s has been scouting for opportunities to foray into the traditional sweets & snacks segment as part of its strategy to diversify beyond its core breakfast cereal category. On the other hand, Haldiram’s group is one of the leading manufacturers of ethnic/traditional snacks (namkeens), sweets, western snacks and ready-to-eat food ranges in India. It has a geographic footprint across 50 countries. The company, though cash-rich and profitable, has been exploring options to raise investments to scale up its operations and further expand geographic presence. 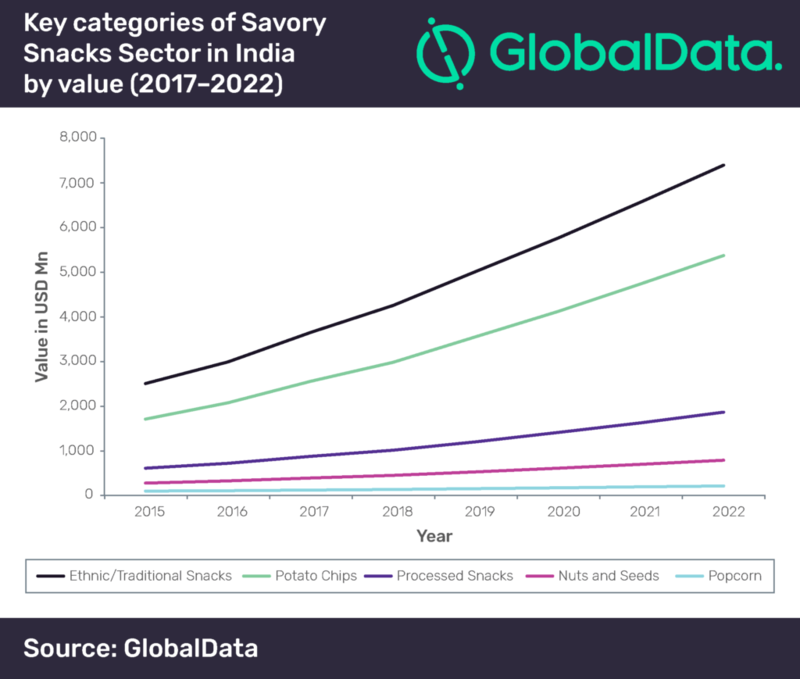 “The Indian savory snacks sector was the fourth largest globally and the third largest in the Asia-Pacific (APAC) region in 2017. GlobalData forecasts the sector to grow the fastest across the top 50 global economies at a compound annual growth rate of 15.8% during 2017–2022. The sector is expected to value US$15.87bn and become the third largest globally by 2022. In addition, for Kellogg’s, India is a crucial market as it accounts for 10% of the APAC revenue. Given that Kellogg’s Indian wholly-owned subsidiary has managed to achieve a double-digit growth in the past few years, the deal may boost its market presence in India. “Kellogg’s has been ultra-conservative in the Indian market even after a presence of more than two decades and has only been pushing organic growth strategies. Since 2017, the company has been expanding its portfolio with larger grain-based products such as muesli, oats and granola. On the other hand, its deep pocketed rivals such as PepsiCo, ITC Foods, MTR and Britannia have been pushing ready-to-cook and ready-to-eat products in the space. With Nestle foraying into the breakfast cereal category with Nesplus in July 2018, the breakfast cereals market became more competitive.